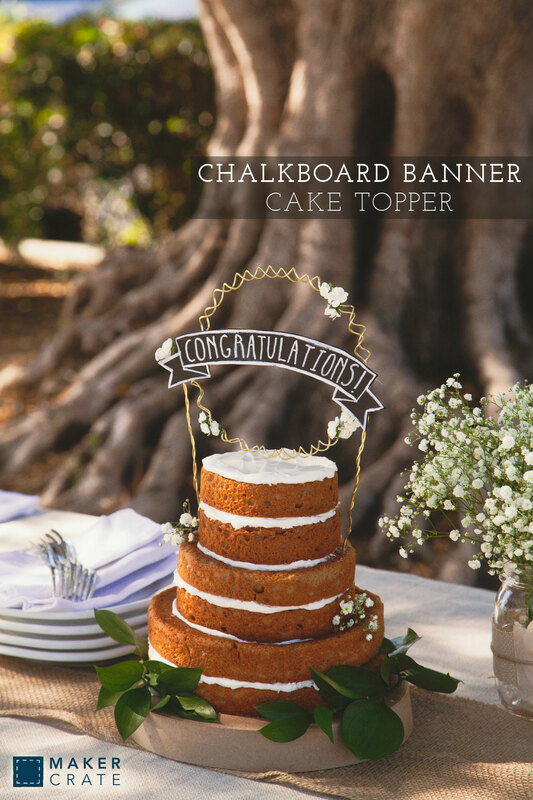 This cake topper is perfect for any kind of event, whether it be a simple rustic party or an elegant wedding. I really enjoyed the process of creating the spiraled wire hoop, and lettering the chalkboard banner was also a lot of fun! The paper flowers add a feminine touch to the project and are a great way to customize the cake topper. I chose to use them sparingly but I could also see it looking lovely with many around the entire hoop. Gather your materials and download the template from the materials list above. Wrap your wire 27 times around a pencil, leaving a two inch tail on either end. Do this again to create two identical coils. Grabbing the tail on each end of the spring, slowly stretch the wire. You are creating the circle for the cake topper, so hold your wire up to the template to determine how far you need to stretch it. Twist both wires together so the coils are staggered. Following the template, bend the wires into a circular shape. Twist the ends of the wires together to form a circle. It helps to use the jewelry pliers to twist the wire together securely. The twist will be hidden behind the banner, so it does not have to look perfect. Cut a 16 inch piece of wire and wrap it around the hoop at the seam where you joined the wires in the previous step. Twist the wire around itself to secure it to the circle and create a leg for your cake topper. Cut another 16 inch piece of wire and do the same on the opposite side for the second leg. Finally, add a dab of hot glue to keep the legs from wobbling. Cut out and trace the banner template onto the book board. Cut it out with an X-Acto knife. For best results do not try to cut through the book board all at once—instead retrace the outline multiple times with the knife until you fully cut through. Paint the banner with chalkboard paint. Make sure to cover both sides and the edges. Let dry and apply a second coat. Using the template as a reference, draw chalk lines on your banner. Then write any message you like! Hot glue the banner onto hoop so that the point where the legs join is hidden. Twist some flowers into the hoop in little clusters. Wrap the stems around the wire a few times and trim off the excess. Your cake topper is complete! The method to mount the topper will depend on the cake. If you are incorporating this piece into an existing plastic topper, it could simply be glued to the topper and then the topper placed on the cake. For my presentation, I attached the wires to bamboo cake dowels, then stuck the dowels into the cake. Don't place the wire directly into the cake, as the wire is not food-safe. & save up to 10%!